The CD56 antigen is a 140 kDa isoform of the Neural Cell Adhesion Molecule (N-CAM). Post-translational modifications to the polypeptide include N- and O- glycosylations, acylation, sulphation and phosphorylation. The different N-CAM isoforms have molecular weights ranging from 135 to 220 kDa. The CD56 antigen is moderately expressed on a subpopulation of peripheral blood large granular lymphocytes and on all cells with NK activity. It is also expressed by subsets of T lymphocytes. 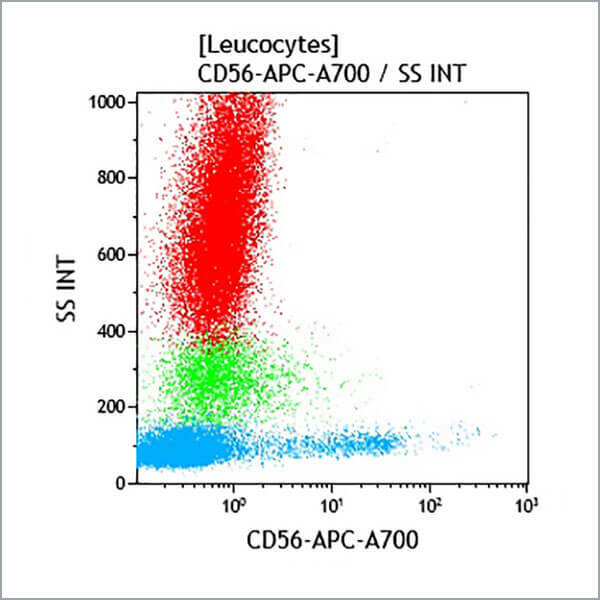 CD56 antibodies do not react with granulocytes, monocytes or B cells. *Alexa Fluor and Pacific Blue are registered trademarks of Molecular Probes, Inc.